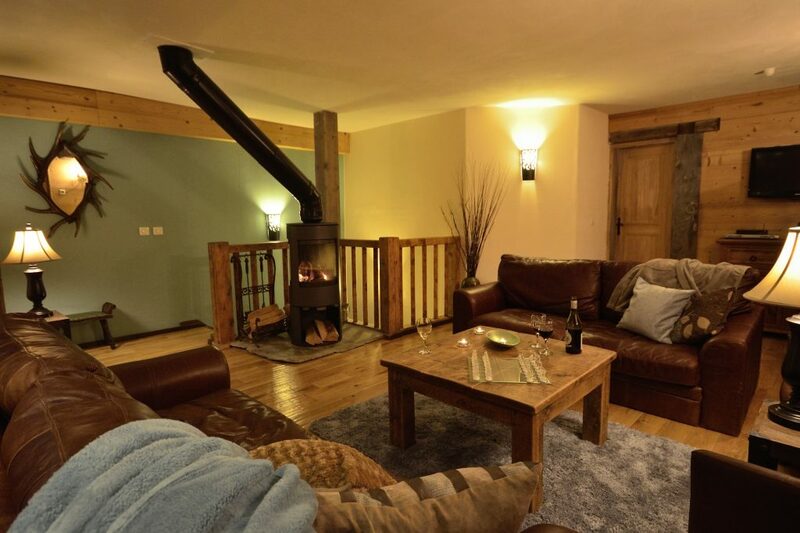 Chalet Chene is a two-storey traditional styled chalet with vaulted wooden beam ceilings, wood floors and large double-sided log fire. Located within the exclusive La Bataillette collection of private Venture Ski chalets in Sainte Foy, Chalet Chene has stunning views from the top floor living area down and across the Isere Valley. Built in 2011, Chalet Chene comprises a 4-bedroom spacious and well appointed chalet with a contemporary open plan kitchen, dining and living area on the upper floor including a large walk-around fireplace. Two of the four bedrooms are double sized, en-suite with enough space to include a cot if needed. Through the panoramic lounge windows there are beautiful views across the Isere Valley towards Les Arc. Catering options are available; Guests may purchase a hot breakfast option and/or 3-course evening meal in our on-site Black Diamond Lodge restaurant located next to your chalet. Breakfast is £15 per person/per day (children U13 £7) and dinner is £40 per person/per day (children U13 2-course menu is £20) with choices from the a la carte menu not including beverages. Tables available at either 6:30pm or 8:30pm seven days a week. Room 1:Queen bed with space for cot if required; walk-in wet room-style shower, WC en-suite; Unspoilt views across the valley (overall area 13m²). Room 2:Queen bed with space for cot if required; walk-in wet room-style shower, WC en-suite; Views across the valley and piste (overall area 13m²). Room 3: Twin bed format (can be Super King) access to bathroom with bath & WC next to bedroom (overall area 10m²). Room 4: Twin bed format (can be Super King) access to bathroom with bath & WC across the corridor; North facing views across the piste (overall area 10m²). Chalet Chene provides boot dryers and lockers for ski equipment. After a strenuous day in the mountain the chalet provides you with a relaxing environment to unwind and enjoy the company of family and friends. TheVenture Skispa and swimming pool is accessed down the steps and across the drive. In the peaceful area of La Bataillette; Chalet Chene is a five minute walk from the resort centre where there are shops, local restaurants and bars, and the main ski lift. Even closer to hand is theBlack Diamond RestaurantandApres-ski bar. The chalet is close to private creche and childcare facilities. Babysitting services are also available.